The first method you should try is to remove Acronis Disk Director through the Control Panel. This is usually the easiest way to remove the program and requires a lot less work than the alternative method. If your installation of the program is corrupted, you'll likely have to skip this process and try to use the cleanup utility. Otherwise, follow these simple steps to get rid of the program. Click "Start," "Control Panel" and then click "Uninstall a Program" under "Programs." Click "Acronis Disk Director Home" and click "Uninstall" to launch the Windows Installer utility. At this point, Acronis will analyze your computer's partitions to make sure it's okay to remove the program. You might see a prompt to close antivirus programs that are running, and you might have to restart your computer if you don't close the listed programs. You'll know the uninstall was successful if you look in the installed programs list and don't see Acronis Disk Director listed anymore. If something goes wrong or you get an error message, proceed to the next method. The Acronis Disk Director 11 Home Cleanup Utility is a free download that is available here. It can completely remove the program if it's corrupted in some way or if the program's not listed in the Control Panel for some reason. Before proceeding, click "Start," "All Programs," "Disk Director" and "Install Acronis OS Selector." Click "Uninstall Acronis OS Selector" and "Next" to remove this part of the program from your computer. If you don't do this, you might have problems if your computer has multiple operating systems installed. If you have other Acronis products installed on your PC, keep in mind that this process uninstalls everything and that you'll need to reinstall any other Acronis programs later. If you're unsure if you have Acronis products, you can look in the "Acronis" folder under "All Programs" on the "Start" menu to verify. Press "2" and "Enter" and then press "Y" and "Enter" to confirm. Click "Close" if any message comes up about extracting files during the uninstallataion process. Press "Y" and "Enter" when prompted to close Explorer.exe. Press "Y" or "N" and "Enter" to choose a restarting option. 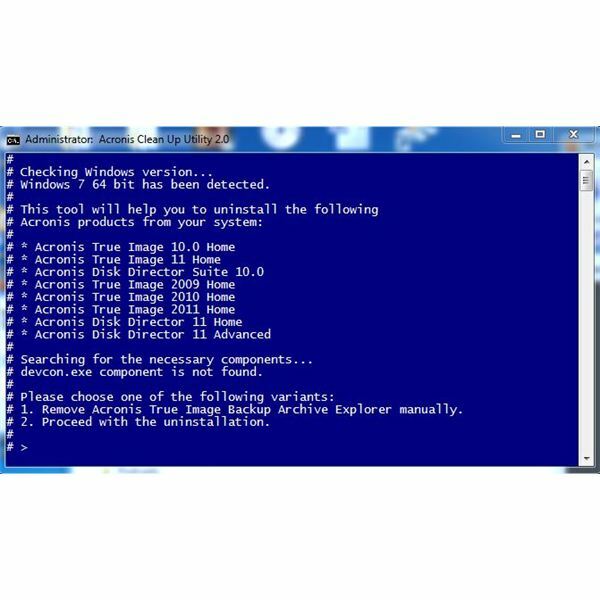 You'll need to restart your computer to get rid of the last remnants of Acronis Disk Director, especially if you plan to reinstall the program or upgrade to a different version.